In this Lecture, we address the properties and the structure of spiral arms in disk galaxies. As we have seen when discussing the morphology of galaxies, disk galaxies are characterized by a remarkable spiral pattern, which is particularly evident in the UV and optical blue bands. 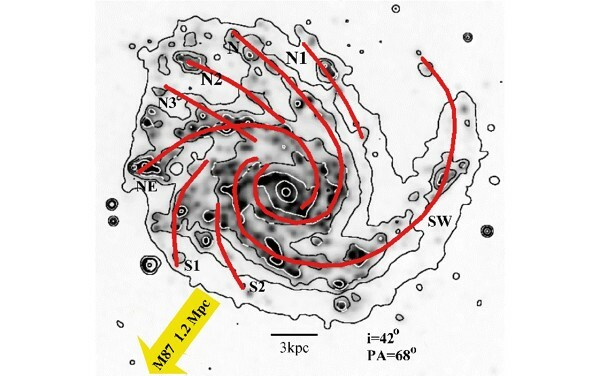 As a fact, the magnificent spiral structures are associated with the sites where the star-formation rate is high and with bright and young OB associations. We start presenting a morphological classifications of disk galaxies based on the morphology of the spiral arms as seen in the optical, and then we discuss in some detail the theoretical model first proposed by C.C. Lin and Frank Shu (1964). The optical appearance of spiral galaxies is extremely diverse. 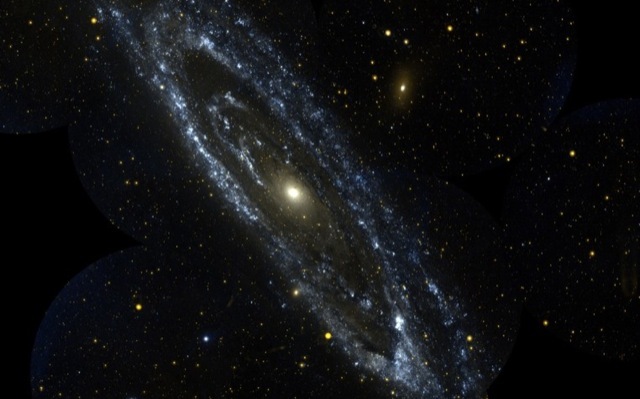 The Andromeda Galaxy seen by the UV space telescope GALEX. Credit: GALEX team, Caltech, NASA. The first classification system was developed by Edwin Hubble. It was later expanded by Allan Sandage (in the 1960s), and by Gerard and Antoinette de Vaucouleurs. As we have already seen in the second lecture, along the Hubble sequence from type Sa to Sb, Sc and Sd, the bulge gets smaller and the spiral arms grow wider and more open. 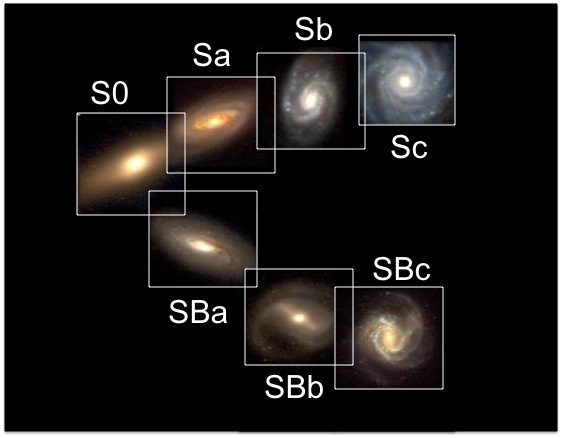 Two parallel sequences, SBa to SBd and SABa to SABd, describe galaxies with central bars and ovals, respectively. The Hubble sequence for disk galaxies. Adapted from C.Q. Trinh, Univ. of California at Berkeley. 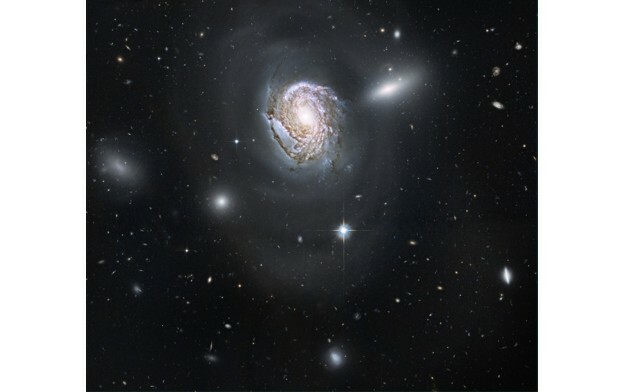 NGC 4911 in the constellation of Coma. See the interacting companions and the background objects. Credit: NASA (HST). 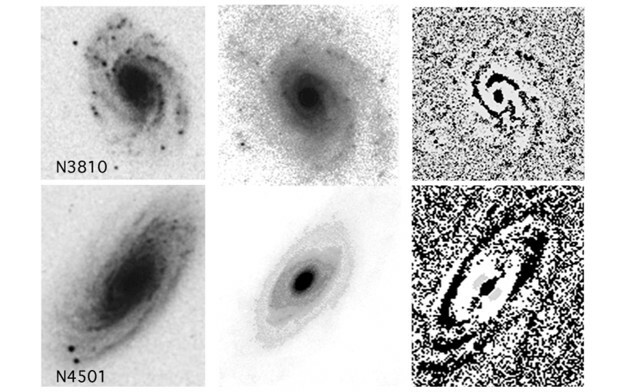 A classification of the spiral structure is even more complicated than galaxy morphology. 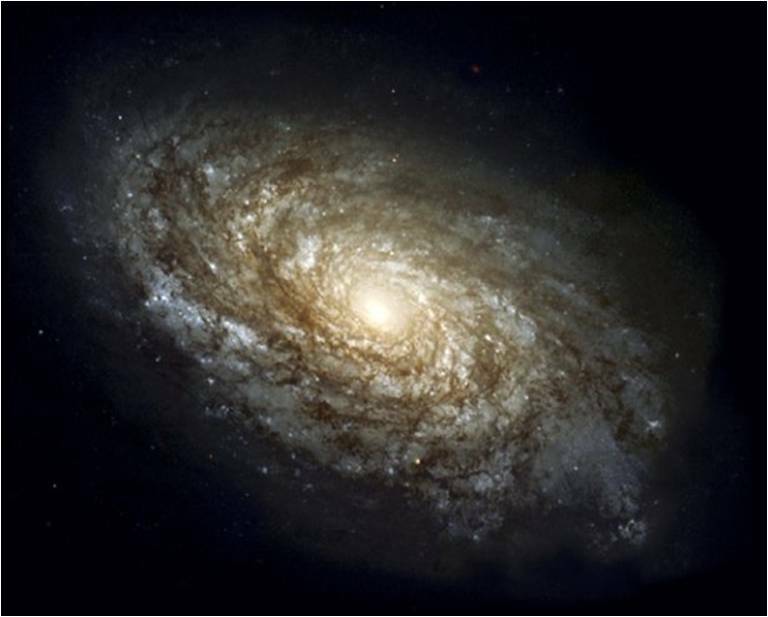 The spiral structure is observed to vary from galaxy to galaxy, even within a single Hubble type. 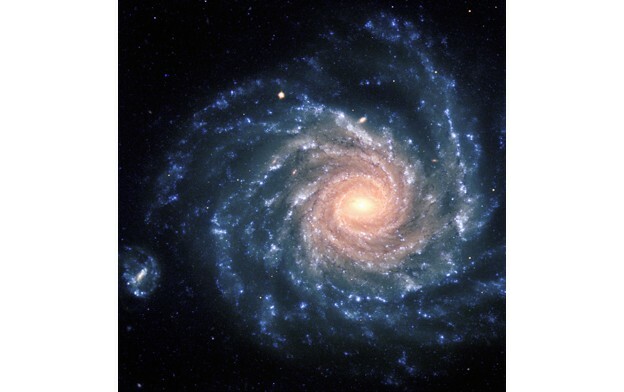 In the 1960s, Sidney van den Bergh introduced a classification system based on the regularity of the spiral arms. In the 1980s, this was revised by Debora and Bruce Elmegreen. 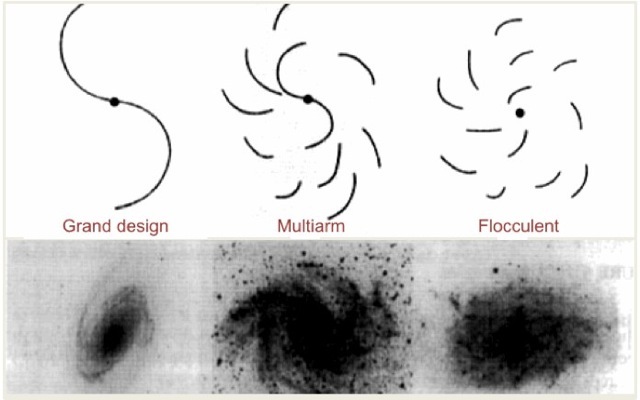 Generally speaking, spirals are divided into three categories: grand design, multiple arms and flocculent (see figure). A grand design spiral has prominent and well-defined, single, bisymmetric spiral arms that extends from the central bulge to the outer limit of the visible disk. The spiral arms of a grand-design galaxy extend clearly around the galaxy through many radians and can be observed over a large fraction of the galaxy’s radius. 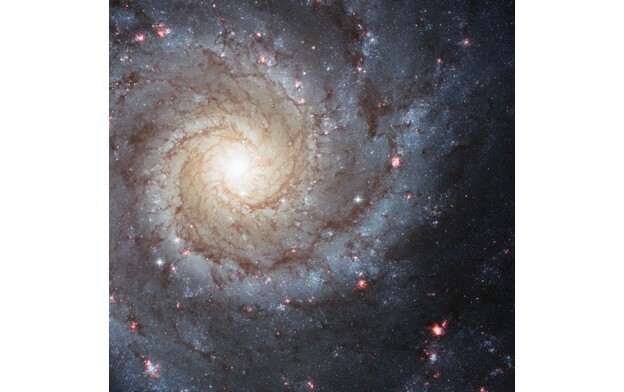 About ten percent of spiral galaxies are classified as grand design type spirals, including the bright galaxies M51, M74, and M81. At the RHS the three basic arm categories in Elmergreen’s classification scheme. From Elmergreen's book Galaxies and galactic structure, Prentice Hall, 1998. Flocculent spirals show patchy and discontinuous arms, which have subtler structural features with respect to grand design spirals. Approximately 30% of spirals are flocculent. Finally, about 60% of spiral show a multi-arm structure, an intermediate pattern between the former two. Next three pictures show magnificent examples of a grand design, a multiple-arm galaxy and a flocculent spiral. Flocculent spiral NGC 4414. Credit: NASA (HST). M81 in Ursa Major, a grand design spiral. This IR picture puts into evidence the old stars, the interstellar dust heated by star formation activity, and the embedded sites of massive star formation. Credit: NASA (Spitzer). M74 is a beautiful example of a multiple-arms galaxy. Image obtained by Hubble Space Telescope using the Advanced Camera for Surveys (ACS) with optical filters. Credit: NASA (HST). NGC 1232, an intermediate spiral galaxy. Credit: ESO. Flocculent spiral galaxy NGC 2841, observed by the HST with the instrument WFC3. Flocculent spirals are also said to be stochastic spirals. Credit: NASA (HST). It is worthy to note that also the underlying disk, made of a red and old stellar population, is clearly different in different types of spiral galaxies: the stellar disk of a grand design spiral shows a spiral pattern when seen in the NIR too, while the old disk in flocculents is uniform. See, for instance, the different appearance of the galaxy NGC 5085 when observed at different wavelengths (next picture). In order to interpret these observations, recall that in the near-infrared most of the stellar light is emitted by old, low-mass stars. These stars do not contribute much to the total luminosity at optical wavelengths, but they are the dominant stellar population in terms of mass. Therefore, colors of spiral galaxies correlate with the morphology of the spiral structure. Flocculent galaxies show very weak arms in the IR. Their arms are usually strong in the blue, as their structure is shaped by a strong star formation. However, it is also possible to find flocculent spiral galaxies with arms which appear to be faint in the blue. In these cases, the flocculent structure arises from weak stellar density ripples. On the other side, grand design galaxies have strong near-infrared arms which are stellar density enhancements. Their spiral pattern is visible in the stellar when observed in the NIR. This demonstrates that the spiral structure in these galaxies is not limited to the gas, but it comprises all the disk components. In other words, arms represent a real density perturbation in the disk matter distribution. 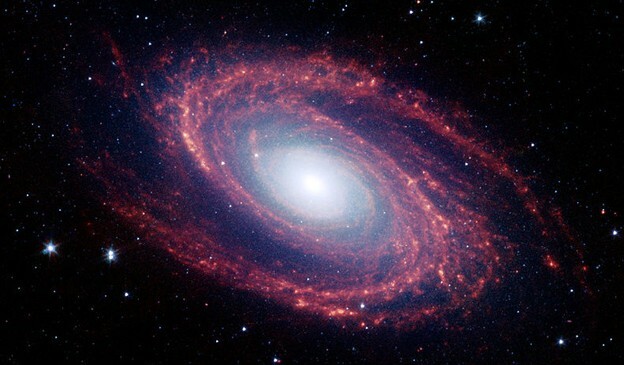 This fact allows us to give a coherent interpretation also of the NIR images of spiral galaxies. Grand design is a density wave. Indeed, it involves a spiral in the underlying mass distribution; global coherence implies that a global process generates the structure. On the other hand, flocculent spirals are not density waves; lack of coherence implies that a local process generates the structure. Contour plot of the NIR emission of the Sc galaxy NGCÂ 4254 overlaid on an Hα map, showing a consistent behaviour of gas and stars. From Chyzy et al., A&A, 474, 415, 2007. Before analyzing the structure of the different spirals morphologies, let us note that so far we have shown spiral structures in isolated galaxies. However, symmetric spirals like those seen in M81 can also form when a galaxy is strongly perturbed by a close encounter with another galaxy. Halton Arp (1966) was the first to illustrate such a mechanism in his Atlas of peculiar galaxies (Caltech, 1966). 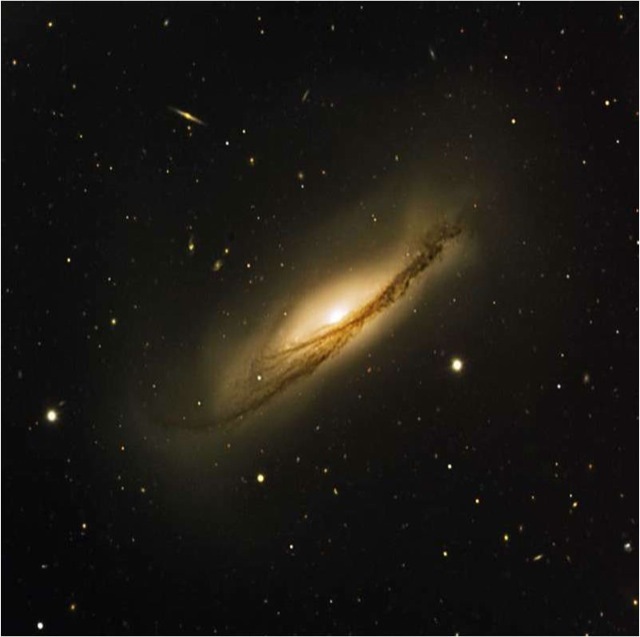 Pioneering numerical simulations by Alar and Juri Toomre (1972) have shown that close encounters can actually give origin to symmetric spiral arms: tidal gravitational forces during the encounter can perturb the stars so much that they move from a previous near-circular orbit to more elongated orbits, especially in the outer regions of the disk. 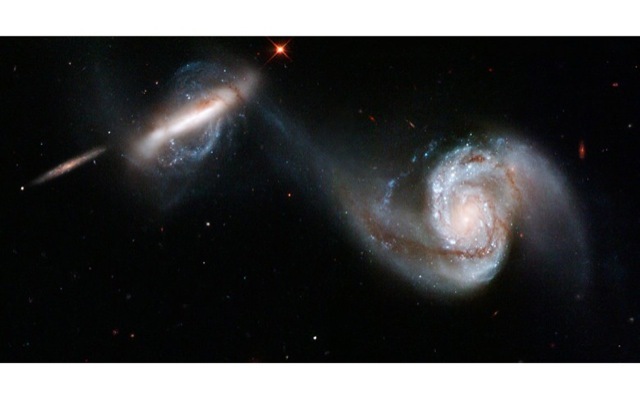 In the picture at the RHS the system Arp 87 (from Arp’s Atlas of Peculiar Galaxies), where both galaxies have been distorted by their gravitational interaction. Stars, gas, and dust flow from the large spiral galaxy, forming an enveloping arm around its companion. This elongation may be initially along a common line of apses, but under the influence of galactic differential rotation the elongations at different radii rotate at different speed, so that the stars bunch together in a symmetrical spiral pattern. Self-gravity amplifies this pattern, and it propagates into the inner disk. The outer tidal arms could also trigger the growth of an inner spiral wave mode, which then persists much longer than the initial tidal wave. 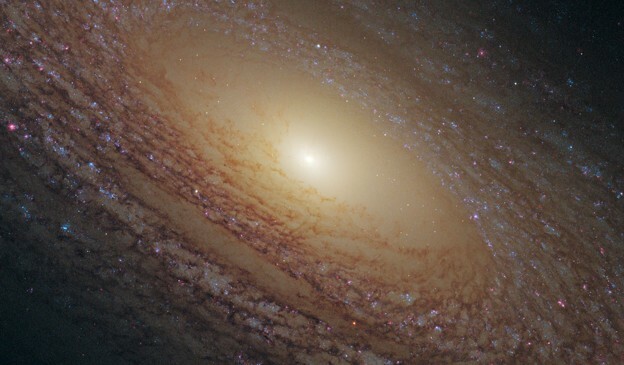 NGC 3190, a tidally distorted galaxy. Credit: ESO. Spirals arms are classified according to their orientation with respect the direction of rotation of the disk. The outer tip of a leading spiral arm points in the direction of the disk rotation, while trailing spiral arms point in the opposite direction. While this classification is very intuitive, it is not easy at all to determine whether a given spiral arm is leading or trailing. 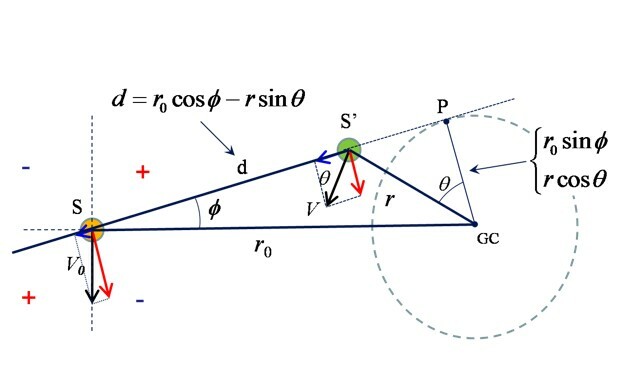 Radial velocity measurements and the determination of the shape of the spiral pattern are not enough to distinguish between the two cases: it is also necessary to establish which side of the disk is closer to us (i.e., to the observer). Indeed, Doppler effect measurements allow us to decide only which side is approaching and which receding (see the figure, where the red marks the receding side, the blue the approaching one). 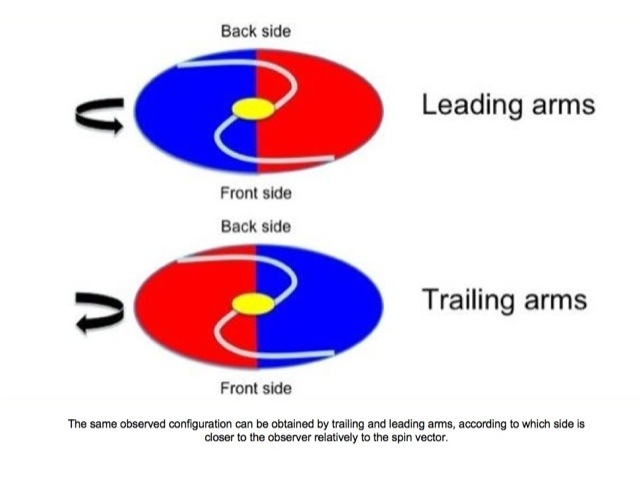 However, in order to determine whether the spiral is trailing (or leading) it is necessary to know whether the side at y > 0 is behind or in front of the plane of the sky: in other words, are we observing down on the top of the disk, or up from underneath? The different morphologies of spirals are likely related to a different origin and a different underlying physical structure. It is generally believed that spiral arms form when compression waves propagate through the disk, growing in length and amplitude as a consequence of self-gravitational forces. As the angular rotation of the disk is approximately inversely proportional to the radial distance, waves appear as spirals. In a large fraction of disks, these spiral waves become so strong that they drive shock fronts into the gas, triggering local events of star-formations in the disks. Velocity components for the source S as seen by the observer S'. Both are in circular orbits about the Galactic Center GC. (there is poor agreement among different observers). Being velocity gradients, A and B are in fact frequencies: e.g. the rotation curve is locally flat. A detailed morphological study of a system of two interacting galaxies, the pair NGC 5752/4 in Bootes. Web site of the survey COSMOS.